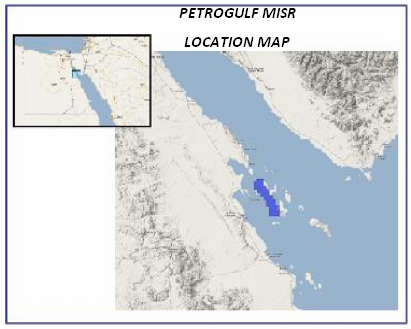 The company's concession areas are located in shallow water archipelago in the South-Western entrance of the Gulf of Suez about 80 km northwest of Hurghada city. The concession area Includes Geisum and Tawila West fields. Thebes Carbonate, Cretaceous sand and fractured Basement are the main reservoirs in South Geisum field, whereas the Miocene sand is the main reservoir in both North Geisum and Tawila West fields. 1985: Geisum Company is established as a joint venture company between EGPC and Conoco. During the partnership from (1985-1987) the company had successfully drilled four wells in South Geisum field. 1987: Conoco assigned its interest in the concession agreement to EGPC, who became the sole owner of Geisum oil company as joint venture company. 1988-1990: the company drilled four development wells in South Geisum field. In 1989 discovered oil in the Cretaceous sand and the fractured Granitic basement in the north-eastern side of South Geisum field. 1991-1999: the company started the development of Miocene sand in North Geisum field. In 1991, discovered the Basal Rahmi Sand as a new Miocene reservoir unit. Seventeen wells were successfully drilled, based on the two dimensional seismic interpretation conducted in 1993, and the simulation study carried out in the field in 1993. 1994: Geisum was granted Tawila West concession for development and In 1996 Geisum drilled its first well in Tawila field. 1999-2005: a successfully development campaign had been performed for South; North Geisum and Tawila fields, based on the interpretation of the 3D seismic conducted in 1998, and the geological studies carried out for the fields. In 1998, Thebes Carbonate had been added as a new reservoirs in South Geisum field. 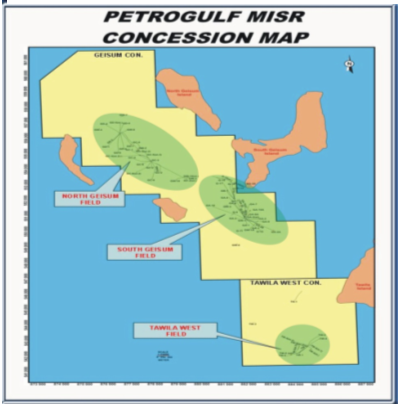 2008: Geisum oil company was re-named Petrogulf Misr Company after established a joint venture company between Ganope, Pico Gos Petroluem Company Limited and Kufpec (Egypt) Limited. The company achieved the development plan, by drilling one well in Tawila field, followed by ten wells in South Geisum and two wells in North Geisum whereas all wells were successful and turned as oil producers. 2-D Seismic surveys were conducted over North Geisum field in January 1993 to complete the development phase. In 1998 the 3-D seismic survey is processed under the PSTM migration. An integrated 3-D seismic interpretation for the processed seismic cube was accomplished in June 2000. The interpretation was associated in developing both south Geisum and west Tawila fields. A reprocessing was performed for the 1998 seismic cube in PSTM domain using new techniques in 2007. A 3-D, OBC seismic survey was conducted over North Geisum field in 2008 to cover the northern part of south Geisum field with an area of about 114 sq km. The 3-D seismic acquisition data covered north Geisum is processed as a PSTM domain in 2008. The interpretation of the processed data revealed a prospective and encouragement areas. The 3-D seismic survey “1998 seismic cube” is reprocessed as PSDM in 2009 using the beam depth image migration technique. Generate a comprehensive geological structure configuration . evaluate and recalculate the reserves of Miocene sand. This study presented an overall depositional model for the Miocene and Cretaceous sand in Geisum and Tawila West fields. The petrographic and sedimentological study carried out for the Thebes carbonate. Illustrated the diagenetic process subjected to Thebes Carbonate. It was important to understand the diagenetic process to apply the optimum carbonate simulation technique to enhance the petrophysical properties and productivity for this reservoir. This study demonstrated the orientation of the fractured sets using Formation Microscanner, and identify the orientation of the fractured sets for the highly fractured zone and its relationship with granite rocks types. Based on this study selected location for development wells encountered the high fractures zone in basement, and drilled successfully horizontal well in the fractured granitic Basement were accomplished. This study established a depositional setting of Miocene sand within the area and get a better understand for the distribution and continuity of this sand in the undrilled areas. This study had an efficient role in the selection of the proposed location of the exploratory wells. This study determined the main source rocks units that charged oil in each fields, and established a better understanding of the Generation time, expulsion and migration pathways of the hydrocarbon from surrounding basins to the reservoirs.